Kingborough’s Low Hanging Fruit project was a cause for celebration at the Kingston LINC recently. The popular expression low hanging fruit comes from a reference to fruit-bearing trees with branches low enough for fruit to be reached without too much effort. In Place Making, the expression low hanging fruit generally means selecting spaces where a small amount of effort and resources can make a big difference to creating more people-friendly spaces within the community. This event was to celebrate the completion of three projects that bring the outdoor space around the Kingston LINC to life. The Protect our Swifty mural was installed on the Hutchins Road side of the Kingston LINC building in March. Local artist Fran Parker worked with young people across Kingborough to create beautiful panels that raise awareness about our critically endangered Swift Parrot. This was completed by members of the community and local schools and shows images of the Swift Parrot, their young, migration patterns and their different needs while in Kingborough – such as food (blue gum and black gums flowers), habitat, nesting and safety from predators. Bunnings Warehouse Kingston donated materials and installed the artworks. Artist Deborah Wace worked tirelessly painting the Children’s Silhouette Mural on the car park side of the LINC, and has brought each silhouette to life with a unique and playful image. Children were asked to pose along the wall while their outline was made in chalk or water. Deborah then enlivened each child’s image with individual paintings within the silhouette, capturing the fun and frivolity of the sessions, as well as invigorating a plain wall. Over 40 children participated and will be part of the wall for years to come, celebrating their connection with the library. This project was supported by The Lions Club of Kingborough. 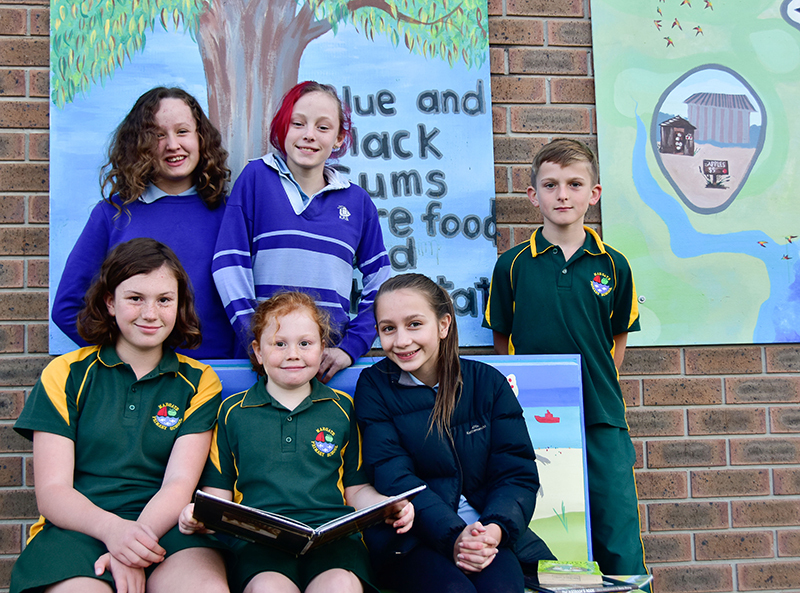 The new Book Benches were made possible through a Kingborough Council Community Grant. Artists and illustrators Sonia Strong and Jane Burrell worked alongside members of the Channel Men’s Shed to create two beautiful benches, to inspire and promote a love of reading in young people and showcase Kingborough’s local authors and artists. Kingborough’s first Low Hanging Fruit project was initiated in 2011 by Kingborough Council to upgrade the front of the Kingston LINC. The project involved young people working with a Landscaper to develop practical skills in landscaping, urban design and furniture making. All the trees, landscaping, benches and picnic tables between the LINC and Channel Court are the result of that project. Other Long Hanging Fruit projects include the Welcome Words mosaic tiles in front of the Civic Centre; the Whitewater Creek Mosaic Nature Trail and the Totem Poles at either end of the Whitewater Creek track.